Posted on May 10, 2014	by Ken W.
So, I got ahead of myself in fabricating the forward spar reinforcing angles, HS-810/HS-8-14. The instructions said to drill all pilot holes. 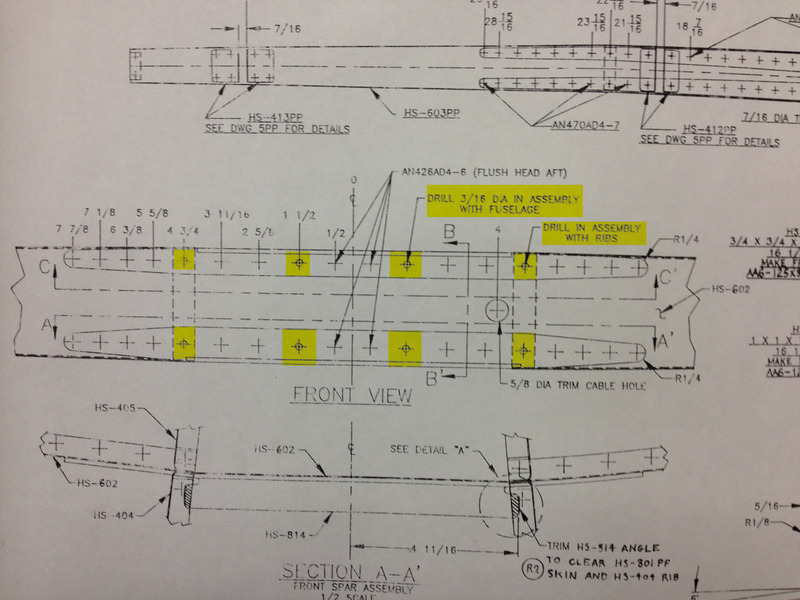 I thought this included the holes 1/2″ outboard of centerline and the holes for the two rib locations. I was under the impression that the notation on the drawing was about “final-drilling” to size. But apparently not. After rewatching the Orndorf video on this segment, I saw that the holes are undrilled when the fwd spar gets riveted together. A search on Vansairforce.com confirmed that these holes (even pilot holes) should not be drilled until being match drilled in place. Oh well. I’ve ordered new parts. And, I’ve moved on to the Vertical Stab while I’m waiting for them.